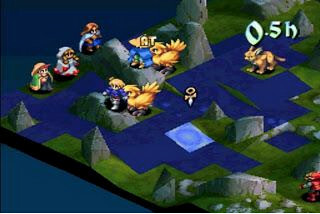 It’s one of the forefathers of the (beloved by a fraction of the population) Tactical RPG genre. As I said in my Ogre Battle 64 review a while back, games like this often have a rich storyline. I’ll try to keep it brief, but basically, the king of the land of Ivalice has just died and there are two candidates for the throne: the king’s infant son or the king’s half-sister, which results in a civil war erupting between each candidate’s supporters, even though the 2 candidates could care less about the whole ordeal, they are merely puppets to be used by the nobles. You take the role of a young squire named Ramza, who serves under his 2 older brothers who are attempting to put the king’s son on the throne. 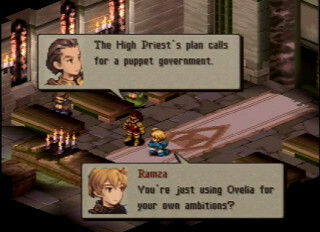 But eventually, he discovers that both sides are being manipulated by the church of Glabados (The primary religion in Ivalice) so they can turn Ivalice into a theocracy, which becomes the catalyst for Ramza’s journey in the second half of the game. But at the center of it all is Ramza’s former friend/rival Delita, who manipulates, murders, and uses people to seize the throne for himself, under the delusion that he is ending the war for the good of humanity. Now, I could go on about the story for 10 more pages, but this is a review, not a story. Suffice to say that I appreciate the art of storytelling, so it’s a huge factor when I decide which games to play. Now the gameplay is very straightforward; you equip and train your units with the trademark Final Fantasy job system, leaving endless possibilities when it comes to character customization. There are also plot-based characters with unique jobs that join you. You can even recruit Cloud Strife rom Final Fantasy VII. So once your units are all set to go, you move across a grid and engage the enemy. There are many factors influencing the outcome of the battle, including elevation, different terrain, and whether you attack from the side or behind. The only 2 gripes I with the battle system are that spells take a few turns to charge (They should be used when you select them damn it!) And if one of your units falls in battle, you have 3 turns to revive the unit or he/she dies permanently. I can’t tell you how many times I’ve had to reset after a 15-20 minute battle because I lost a powerful character in battle. So frustrating… The graphics are, quite frankly, sub-par. The sprites are ok, but the environments could look better. I mean, Castlevania: Symphony of the Night, had sprite based characters, but nice looking backgrounds. Final Fantasy 7 and 8, and the first 3 Resident Evils on the PS1 had pre-rendered or just nicer looking backgrounds. This game’s graphics look somewhere between SNES and PS1 standards. The soundtrack could also be better. I mean, Final Fantasy is known for its great tunes, but I can’t really recall a specific song off the top of my head, and I’m usually good like that. I have lots of video game music on my ipod so I think I know what I’m talking about. I’m not really saying it’s terrible, but I’m saying it’s just not very memorable. Despite its shortcomings, I found myself not being able to put the controller down until I beat the game. I invested about 30 hours into this game, and I found it was one of the few times I was truly challenged by a game. It starts off really slow, but once it gets rolling, it’s a lot of fun. Besides, a game that warrants 2 spiritual sequels and a remake had to have done something right. As an RPG enthusiast, I highly recommend this game to anyone who’s willing to give tactical-RPGs the time and effort needed to make the game a truly enjoyable experience. This article is written by Matt DiLiberti, you can follow him on Facebook here.